It's JULY, and what does that mean? I started with a sheet of "Garden Plaza" by Manuela Zimmerman in the Sanctuary collection - both sides are so beautiful, but I chose this side for the colour and print...and it already had a strong centre pattern! I added some builders mesh, the strip from the bottom of the page, string and then sprayed a little Tattered Angels Glimmermist 'Turquoise Blue' and Prima 'Summer Sky' and allowed it to drip across and then tilted the page so there would be a couple of drips under where the photo would be adhered. All the chipboard pieces - 'Smile' designed by Janene Meyerowitz, Seaside frame, Checker Bits and Circle links all designed by Michele Singh were heat embossed with Lindys Stamp Gang Embossing Powders in 'Desert Moon Turquoise', 'Adobe Fire', 'Midnight Bronze Obsidian' - love! The photo is mounted on the packaging...which I try to do as it is equally lovely! I've used a few My2angels 'Gardenia', 'Daughter charm', 'fancy pins' - love! ...and finished embellishing with Prima flowers from 'Something Blue' collection. Photo is of me and my Mum...at the beach.. Absolutely inspired! Love the use of builders tape in combination with the diamond chipboard. Thank you so much for joining in our challenge at Blue Fern Studios!! Alison, this is beautiful! 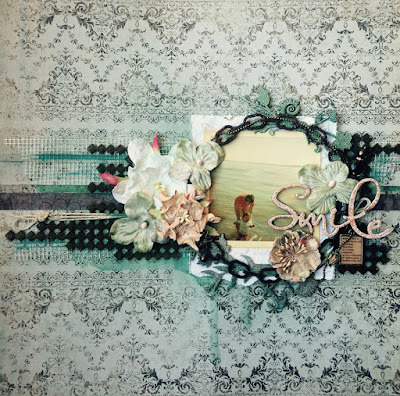 I love that paper and the mesh looks great, along with the chipboard you've used. 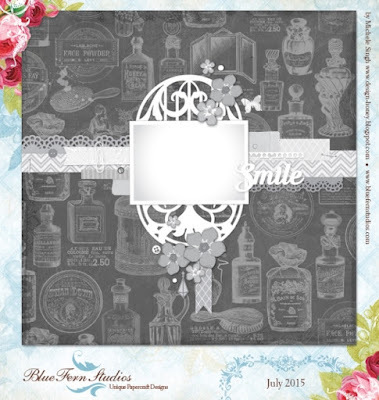 Thanks for joining us at Blue Fern Studios for our Sketch Challenge this month. Thank you Valerie :) It's one of my favourite challenges!! Be sure to check the Blue Fern Studios blog today. We have some good news for you!